I stumbled across this gem while doing a clean up job for a friend of mine on a rental property of his, apparently left at some point over the years by a previous tenant. Possibly a friend of the man in the middle of the photo? I recognize Matt Cameron and Chris Cornell from Soundgarden. 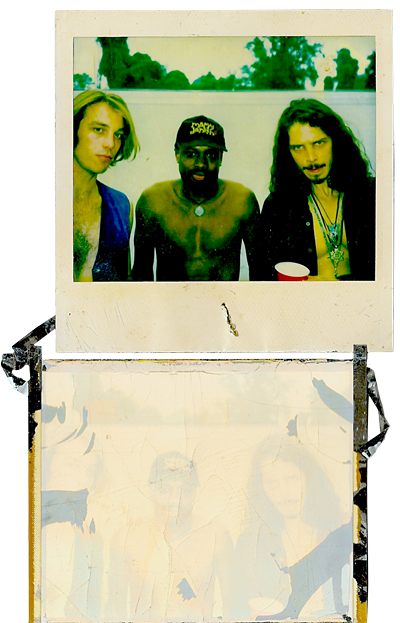 The photo was apparently taken around the “Badmotorfinger” era judging by Chris’ hair length. I can’t, however place the man in the middle of the photo. The Polaroid was completely falling apart and the back was hanging together by a thread. RIP Chris Cornell! Very bummed today.